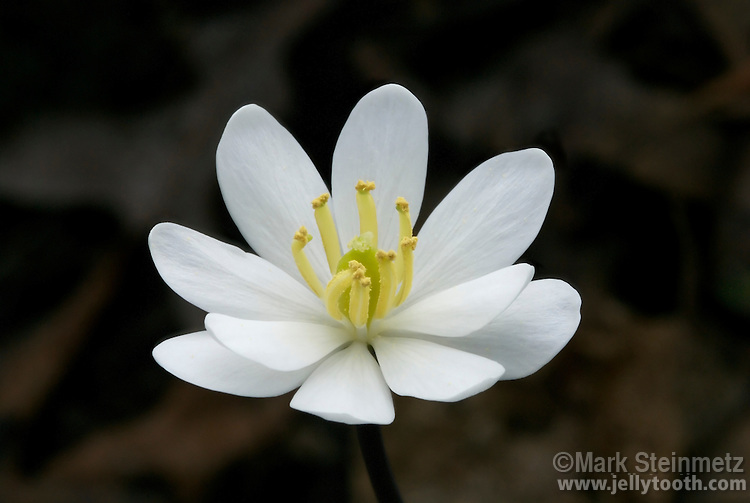 Close-up of Twinleaf flower (Jeffersonia diphylla), an uncommon early spring ephemeral which only blooms for a few days.The scientific name of this woodland wildflower, native to eastern North America, was named in honor of Thomas Jefferson, the third president of the United States. The only other species in this genera occurs in Asia. The common name comes from the two kidney-shaped leaves, which persist well into summer. Franklin County, Ohio, USA.